Meet the artists – or lawyers who represent them – whether they are painters, actors, writers, filmmakers, musicians, or involved in some other creative endeavor. What do Wassily Kandinsky, John Cleese, Paul Robeson, and Andrea Bocelli have in common? Besides being creative geniuses, all have law degrees. We found plenty of Wisconsin lawyer-artists – painters, actors, writers, filmmakers, musicians, or involved in some other creative endeavor. A few of these lawyers are briefly profiled here. 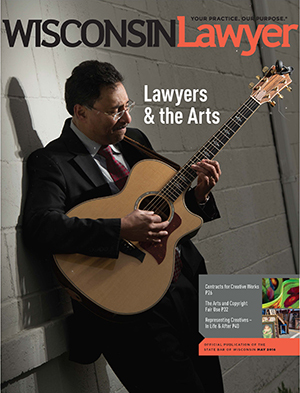 What drives lawyers to combine their pursuit of art and the law? For some of them, art was once a career, while for other lawyers, artistic pursuits have always been an avocation. Some former artists now use their legal skills to assist other creative individuals. And others, whether artists or nonartists, strive to enhance the arts scene in their communities. Landscapes just aren’t Skinner’s thing. He prefers to create art works that are fanciful and playful. “For me, painting is a time of meditation, a time of play,” he says. “Coping” (self-portrait), watercolor on paper, 18” x 18,” © 2011. This painting reflects what most people experience, whether or not we recognize or acknowledge it, says Brent Skinner. The monkeys are our anxieties and delusions, and we tend to deny their existence in a clownish manner. By doing so we risk a sting from the wasp of reality. We can move beyond the pain by finding a doorway to new perceptions. Loretta Webster, nationally recognized for her raised beadwork, stitches a strawberry design for a medicine box. All six pieces are beaded separately, and then sewn together. Loretta Webster, a retired lawyer with the Oneida Tribe Division of Land Management, has been creating beadwork since she was a teenager. But a couple of decades ago, when she was in her 50s, her work took a new direction with her discovery of raised beadwork, as opposed to flat beadwork. The roots of raised beadwork go back to the Iroquois nations in New York, starting in the 1850s. By that time, the Oneida, also part of the Iroquois Confederacy, already had migrated to Wisconsin after the Iroquois tribes lost most of their land in New York. Thus, the Wisconsin Oneida didn’t bring the raised beadwork technique with them. “We missed that tradition,” Webster says. She first learned raised beadwork from two members of the Cayuga Nation in New York, also part of the Iroquois Confederacy, who conducted classes at the Oneida Nation Museum in Oneida, Wis. This art form has surged here and elsewhere, and Webster has been a major part of making that happen, through her own creations and by teaching classes. She’s participated in numerous art shows, won prizes, and will be part of an exhibit of raised beadwork at the James Watrous Gallery of the Wisconsin Academy of Sciences, Arts & Letters in Madison this September. Faith Kohler puts homelessness on the silver screen in “30 Seconds Away: Breaking the Cycle.” View the trailer and learn more about the subjects, the crew, next screenings, and more at www.30secondsaway.com. Her conversations with a man named Harold Sloan eventually turned into a creative project. She started recording their talks on her phone, and soon others in the homeless community wanted to tell their stories, as well. Kohler recognized possibilities for a documentary. A neighbor who’s a film professor steered her to students looking for a film project. After six years of work, “30 Seconds Away: Breaking the Cycle” premiered at the Milwaukee Film Festival in September 2015. When Kohler began this project, she was working as a law enforcement agent for the U.S. Postal Inspection Service, which she did for 13 years. Before that she was a lawyer in private practice for five years. Today, she’s the corporate security manager at Johnson Controls in Milwaukee. A police officer checks the welfare of a homeless man sleeping outside the Milwaukee Municipal Building. Faith Kohler developed the idea for the film “30 Seconds Away: Breaking the Cycle” in 2009, when she was volunteering at a local homeless persons shelter. One of the men who frequented the shelter began telling her about how he became homeless years ago and why he was still chronically homeless. Other people at the shelter wanted to share their stories as well. Kohler noticed a few common threads in the wide variety of stories she heard. One was a sense of total isolation from the rest of society, another was an extreme dislike of law enforcement, and the biggest was a pattern of repeated trips in and out of the justice system that ended with people back outside on the street. Film enabled Kohler to share stories in their original voices … homeless men, law enforcement, a judge, prosecutors, a defense attorney ... all sharing their unique perspective on issues of mental health, substance abuse, law enforcement strategies, available resources, and other factors found in chronic homelessness. “To me, film was a way of humanizing what we as attorneys might otherwise define as ‘issues.’” The end goal was to raise awareness throughout communities, and inspire service to a community that might otherwise remain isolated. Photos: “30 Seconds Away” production crew. She also co-owns a business that designs and sells concealed-carry handbags. “I’m a girly girl,” Kohler explains, adding she could never find a bag she liked for carrying a gun on her law enforcement job. She hooked up with designer Jodi Been to launch Been & Badge in 2014, which makes stylish handbags for women, whether or not they carry a handgun. Creative writing and legal writing are perfect complements for Susan Parsons, now a staff attorney for the Wisconsin District IV Court of Appeals, Madison. Before her current job she was in private practice and clerked for the late Wisconsin Supreme Court Justice Patrick Crooks. Her efforts resulted in her first novel, Vintage, which was published by William Morrow/Harper Collins in 2014 under Parson’s pen name, Susan Gloss, also her maiden name. The book’s setting is a vintage clothing shop – a natural choice for Parsons, given her fondness for meandering through vintage stores and garage sales. “I enjoy looking at other people’s old things and imagining the stories behind them,” she says. “Vintage clothes capture my imagination in that way. Running with that idea was what led to this novel,” which is a USA Today Bestselling Book and a Midwest Independent Booksellers Association “Midwest Connections” pick. What is your creative outlet? Whether you create art, or represent others who do, tell us how you express your creative side. Send us your photos, too. Post a comment at the end of this article or email the editors at org wislawmag wisbar wisbar wislawmag org. Her law background and legal writing experience come in handy in writing a novel, Parsons says. For instance, in Vintage, the shop owner is having problems with her landlord. Reyes grew up surrounded by music in Cleveland, Ohio, the home of the Rock and Roll Hall of Fame and Museum. The area also had thriving rhythm and blues groups, the Motown influence, a world-class symphony orchestra, and diverse ethnic groups, each with its own music. Latino music was part of Reyes’ upbringing due to his Puerto Rican heritage. He started taking guitar lessons in grade school, studied classical guitar in college, and played in a few bands while at the U.W. Law School. Since beginning to practice law in 1987, Reyes’s music involvement has mostly shifted from playing and performing to promoting and supporting music programs. Still, he’s recently begun to play again and perform at church and community events with his 16-year-old son. Currently he’s president of the board of the Latino Arts program at the United Community Center in Milwaukee. Latino Arts brings in artists from all over Latin America to present concerts, workshops, and master classes. Reyes also serves on the board of the Wisconsin Conservatory of Music, where Liberace took his first piano lessons, and previously served on the Wisconsin Arts Board. A small part of his law practice involves entertainment law, mostly negotiating contracts and licensing agreements for musicians. Beth Eisendrath’s art career preceded the 14 years she’s been practicing law. She earned her bachelor of fine arts in painting and drawing, after which she painted, sold her work, and won awards. To help pay the rent, she did drywalling, modeling, and other odd jobs before going back to school for an art education degree and then teaching art in elementary school for two years. When the co-director moved to Chicago five years later, the gallery closed, and Eisendrath weighed her options. She’d long had an interest in law – her father was a Milwaukee lawyer – so she decided to enroll at Marquette University Law School. She got her J.D. in 2002 and now has a solo practice in Wauwatosa. A greeting card designed by Beth Eisendrath. Eisendrath put aside art-related endeavors for several years while in law school and getting settled into practice. But for the past few years, she’s again taken up designing greeting cards. She expects to return to creating full-scale paintings someday, too. Joe Cardamone is a man of many talents – from playing piano to acting in and directing theatrical performances to singing with the U.W.-Parkside Master Singers. In 2011, Joe performed in “Foreigner” (above, he’s on the right). Joe Cardamone’s involvement in community theater goes back about 15 years. When he got cast for a part in his first play, his fellow actors were surprised to learn he was a lawyer. Cardamone’s legal career has included stints as a litigator, both in a district attorney’s office and in private practice. Now he’s the corporation counsel for Kenosha County, and he sees a different kind of parallel between his roles in law and theater. Joe Cardamone recently wrapped up directing “Wizard of Oz” for which he also conducted the pit band. Cardamone’s leaning toward artistic interests started in his childhood. At age six, he told his parents he wanted to learn to play the piano. He continued taking lessons through high school, and at Carleton College he acted, performed in musicals, directed, and worked part time as a piano accompanist for the music department. His community theater work now mostly entails directing musicals. He’s taking a break this season after the birth of his second child in August. But he’ll soon get back to directing, and he figures someday he’ll resume acting, too. Before becoming an attorney, Peter Strand played and recorded as a full-time touring musician with several bands including recording two albums for RCA/Millennium Records. He continues to play sporadic gigs with a Chicago band. Before becoming a lawyer in 1987, Peter Strand was a professional musician for eight years. He toured with various bands and recorded two albums for RCA/Millennium Records. “Music was my gateway to entertainment law,” Strand says. By 2009, Strand and Tom Leavens were ready to form their own Chicago firm, now called Leavens, Strand & Glover LLC, with a focus on entertainment, media, and intellectual property law. It’s a perfect fit for Strand. Peter Strand played with the Milwaukee-based Yipes! during the late 1970s and early 1980s, opening for Cheap Trick among other notables. He still keeps his guitar at hand, and he performs sporadically with a Chicago band. His old Milwaukee band, Yipes!, got inducted into the Wisconsin Music Hall of Fame in 2013 and played a reunion show at the 2014 Summerfest. Strand is heavily involved in Lawyers for the Creative Arts in Chicago, a group that does pro bono legal work for artists. He also helped create the Volunteer Lawyers for the Arts Division of the ABA Forum on the Entertainment and Sports Industries. And he was named the Chicago Entertainment Law – Music “Lawyer of the Year” for 2016. Somehow he finds time to teach a course in entertainment law at Chicago-Kent College of Law. Elizabeth Russell is fond of asking, “how many lawyers do you know who went to law school on a bassoon scholarship?” Russell helps businesses protect their copyright, trademark, and digital business assets, and maintains a vibrant arts law practice. It was after college and realizing that she didn’t really want to be a high school band teacher that Russell went to law school. She practiced in various settings for several years and then veered into arts administration. She worked for the Albany (N.Y.) Symphony Orchestra, and then after moving to Madison, went to work for the former Madison Repertory Theater and Opera for the Young. In 2000, she opened a solo arts law practice. Russell saw her niche and molded it into what she’d envisioned back in law school. She would be a lawyer who represented people who were doing things that interested her – namely artistic endeavors. “I created the exact practice that I enjoy,” she says. Initially, her clients were mostly artists of diverse types. But her client list has expanded to other businesses, assisting them with copyright, trademark, and digital business matters. “When businesses started doing business online,” she says, “copyright and trademark became extremely relevant for most any business anywhere.” She works with clients in the U.S., as well as other countries. Raymond Krueger’s fascination with the visual arts dates back to a young age. He’s never painted, sculpted, or otherwise created visual art works, although he says his now-grown children have dabbled a bit. Still, Krueger, an attorney with Michael Best & Friedrich in Milwaukee, has found many ways, spanning over decades, to devote himself to the visual arts. While he’s not creating art works, he’s helping to build a vibrant arts scene in Milwaukee – and beyond. For instance, for 20 years, he chaired the Georgia O’Keeffe Foundation in Abiquiú, N.M., which was dedicated to perpetuating O’Keeffe’s legacy. Closer to home, he served on the board of trustees for the Milwaukee Art Museum for 12 years, including three years as president and three years as chair. He also served on the building committee for the museum’s Santiago Calatrava addition, which has become an internationally recognized symbol of the city. Krueger takes pride in the art museum’s outreach efforts. For example, the museum’s “After Dark” events for 20- and 30-somethings “have a cool factor,” he says. These are social events, which at the same time attract young adults into the galleries to experience art. The desire to fuel that kind of appreciation for the visual arts is what drives Krueger in his community arts involvement, as well as in representing clients in the architecture field.